Idea display maven projects twice when Group Modules is checked please see the image below. I believe this does not relate to Maven. E.g. common-ui is shown under group node because this module is added to that group. And it is shown under common-parent node because common-ui directory is located under common-parent in the file system (please correct me if I'm wrong). 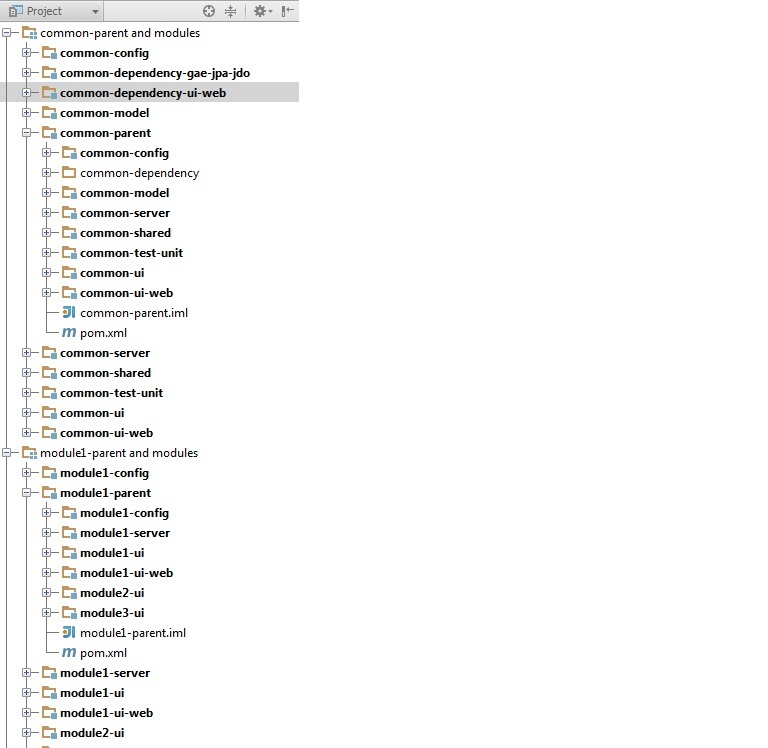 So the Project tree shows exactly the structure that is configured. If you think the project configuration could be improved, please specify how. That's correct all project on the disk reflect the mvn structure e.i. the common-ui is under the common-pareent etc. I thoink Idea should either show the file system structure or maven one but not both. When the option "Create Intellij IDEA modules for aggregator projects" is select the idea is to have the parent pom project to be managed by the source control and visible in the project tree. It should be an option to turn off the double appearance of the modules in the project tree, it is confusing and clatters the view in my opinion at least.